The other day I was savouring a particularly delicious Earl Grey tea and decided to research the topic. As it often happens on Wikipedia, I stumbled upon another page, the one of Twinings, a Londoner Tea marketer. The article is quite short but it caught my attention immediately. The description reads: “It holds the world’s oldest continually-used company logo, and is London’s most long-standing rate-payer, having occupied the same premises on Strand since 1706.” Being a designer, the topic piqued my curiosity and left me wondering if keeping the same logo for such a long period could add (or not) value to a company. Planned obsolescence or design obsolescence is a widespread practice since the modern era. Whether we are talking about cars, clothes, jewellery, appliances, technology or even art, they all end up going out of fashion in a matter of years, sometimes even months. And we accept that as normal, agreeing to buy new clothes and accessories every year, replacing cars and appliances that might still work only because they don’t fit in anymore. Where am I going with all this? Well, logos as old as Twinings’ are extremely rare in the 21st century because design trends are ever changing; the few big companies that often control the essential of a market (oligopolies) set those trends in order to influence people’s lifestyles and attract younger audiences. An example of switching trends (which I personally find incredibly silly) is Pantone, a company that arbitrarily selects an annual color which influences a whole year’s fashion, from clothes to interior decoration and even graphic design. Smaller businesses are often bullied into following the wave to stay in the loop and survive. Every few years, their branding must be redone (by graphic designers like me) to match the industry’s new look and standards. That said, is there such thing as an eternal logo? Or is such an idea pure folly? Twinings is a very peculiar case; they are located in the same premises as were when they opened over 300 years ago in 1706. It was in 1787 that their logo was designed and they’ve kept it intact since. Was there ever a need for change though? In my opinion, no. 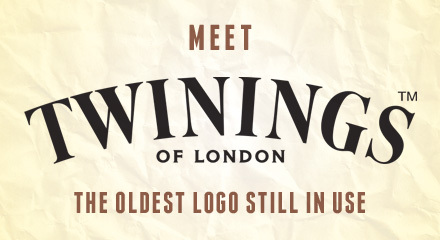 Twinings’ logo is a simple, classy and timeless serif font. Although it is not particularly dynamic, it matches its industry, product and communicates its historical background with success. Was it a strike of luck or masterful execution? After all, it is not uncommon that typefaces go out of fashion. How can a designer foresee 225 years in advance if the typography they use will still look “cool” over two centuries later? Helvetica is in vogue right now but who’s to say it will still be considered beautiful in another fifty years? It could end up like Papyrus and Palatino Lynotype which are considered overused today. Twinings might have the oldest logo still in use, but it’s not the only company whose brand is still near-identical to its original version. Take BMW’s logo with its quarters painted blue and white, inspired by a plane propeller; it has been virtually the same for almost a hundred years, only lightly tweaked to add embossing. Coca Cola, London’s roundel (Underground) and General Electric also have logos which are similar to their first edition. But for every logo that kept the same look, many more changed their emblem over the years. Burger King, Starbucks, Xerox, Best Buy, Gap and Walmart, to only name a few, all recently had a facelift, and while some of them received quite a lot of praise, others were welcomed with harsh critique and disapproval. Keeping your logo or changing it – What’s best? My answer to this question is that it depends. If a logo is badly designed from the start (this could be due to low budget, hiring a bad designer or trying too much to be in fashion, often resulting in an outdated and tacky logo once the trend dies off), redesign is nothing to be ashamed of. It could in fact improve greatly the image of a firm and bring new customers. However if a logo is well done since the beginning there is no reason why it should be changed… unless you are sure you can do much better. If it ain’t broke, don’t fix it – could very well apply here. Of course, some designers will disagree with me and choose to embrace change, arguing that a logo needs to “freshen up” every decade or so. What those designers fail to see is that such tactics are usually employed to lure new consumers to a company. In a Capitalist world of overconsumption, it makes sense to always titillate the public in order to make more money. I believe though that design shouldn’t always be about making money and that change, if embraced, should be done for higher ideals than only getting more green paper in your wallet. Twinings understood that. They found the right logo for them, an emblem that represents them just right, and they kept it. Tina Mailhot-Roberge is a graphic designer, illustrator and co-founder of Veodesign. She holds a BFA in Design from Concordia University, Montréal. She loves to help people and wirte about arts, design, web and technology. Find her on Twitter, Facebook and Google+.